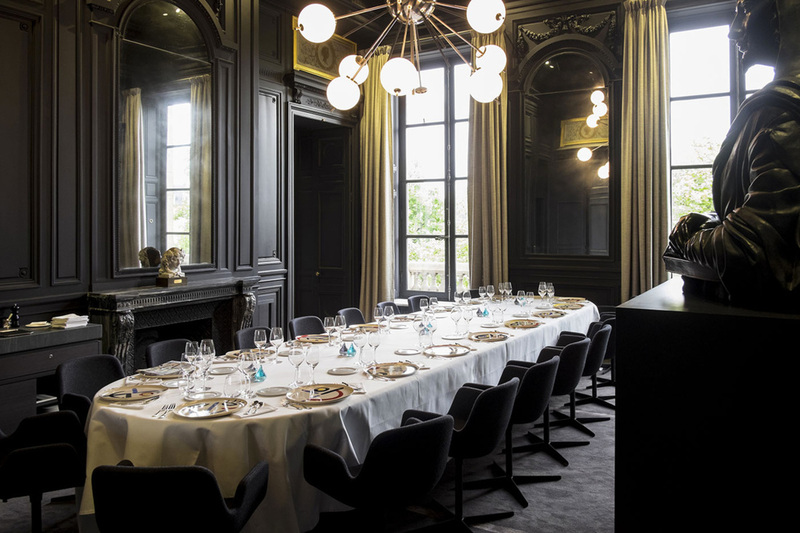 GUY SAVOY WAS NAMED "BEST RESTAURANT IN THE WORLD"
A room with a view, and the best food in the World, not to mention an inch thick wine list! Well, what can I say? This is an historic monument into which my favourite French architect, Jean-Michel Wilmotte, has inserted a contemporary feel into this classic building, which is his trademark. He has worked with Guy Savoy on most of his restaurants, so there is an obvious chemistry between the two men which shows. So it might be a good time now that we have a glass of Champagne in one hand and an eye on te menu to give you a hint: the best and most affordable way to sample Guy Savoy's confections is to book lunch online. It will cost you 130 euros per person for a three courses menu, with three choices for each, mainly the signature dishes in all three categories. But Guy Savoy has always been famous for all the extra little dishes he serves in between courses, so I ended up with maybe 7 to 8 courses, a real bargain! Wine is extra but a lot of the wine list is available by the glass so as a single diner this is a very good way to sample wines that would be out of my budget normally. If you are a couple, you might start with a glass of Champagne - 4 to choose from by the glass - and then try to seduce the sommelier into choosing one bottle of wine to suit your menu. It might not be possible, but it is worth a try! There is no words to describe this dish! And i should put a caveat here, as I am not a great fan of truffles, but this was just out of this world, the consistency, the marriage of flavours, the just enough quantity to savour it at leisure and the richness of the Condrieu to make the whole thing sing like a Beethoven concerto! Saumon figé - à découvrir de toute urgence! Now came the difficult task of choosing a dessert! Opera or Millefeuille? Stay tuned! I love a good Opera,but this time the millefeuille won... I never had such a light, croustillante pate feuilletée, period... " The lightness of Being" comes to mind and that hazelnut cream in between, je ne vous raconte pas! In conclusion, this is once more - see below - the best culinary experience i ever had. 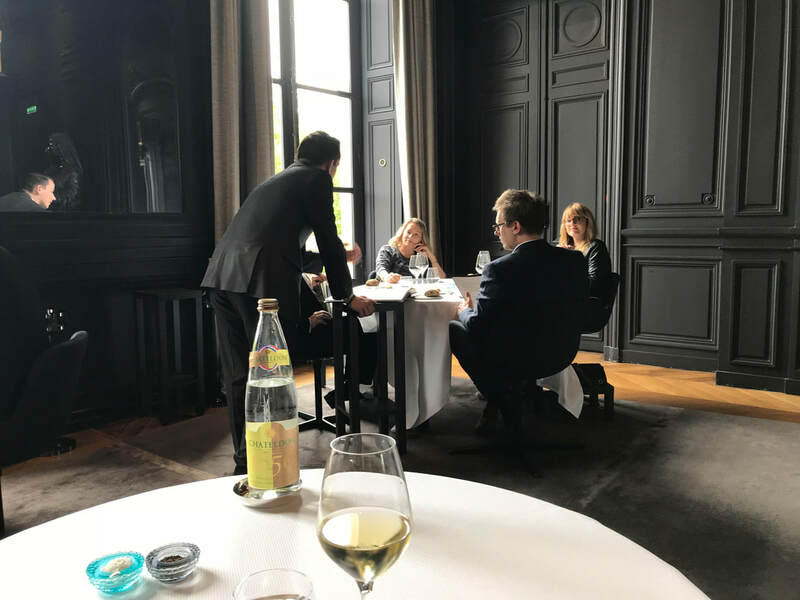 Not only the food is spectacular, but the venue, the service, the choice of wines by the glass, not to mention the main wine list and the overall calm that surrounds the whole exercise were second to none and extraordinary value for lunch! Monsieur Guy Savoy, je vous remercie et j'espère que nous deux vivrons assez longtemps pour pouvoir revenir! The first time was the result of a sales competition at the European level when I was still working for HP France as a Product Marketing Manager. One of our most unpopular product lines among our sales engineers was power supplies and related test systems. The challenge was to get each country in Europe to compete for the highest growth of business within one fiscal year! The winner PMM would be given a fairly high contribution to take him/her and significant other to a restaurant of their choice! France won, and I got 1200 francs of bonus (in today's money, probably around 400 euros). 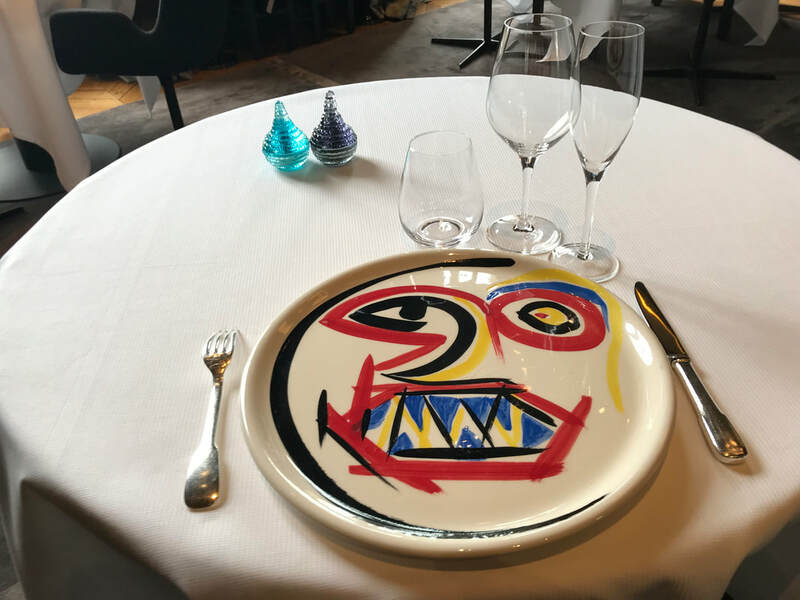 It was certainly not enough for as dinner for two at Guy Savoy, but I was more than happy to fork out (punt intended...) the difference! 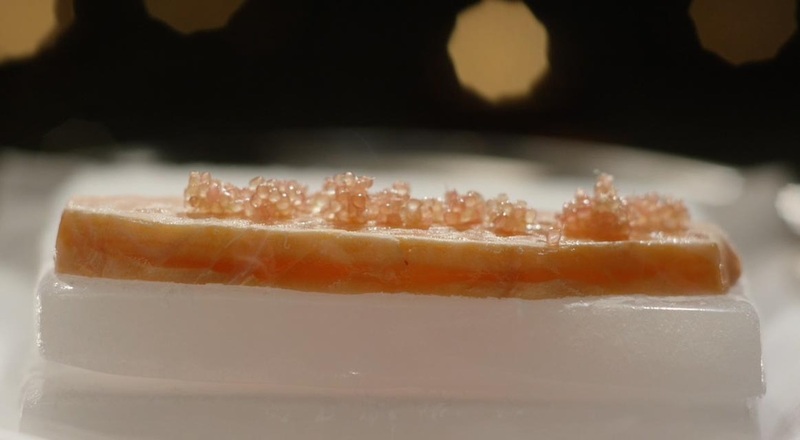 To quote a "Trip Advisor" review, "don't pay your mortgage for a month, but go and have a meal at Guy Savoy"! Guy Savoy is still "aux fourneaux"
The second time was not long after that. my wife had befriended a lady who was an air hostess for Air France, and she had met earlier a Scott who was at the time a very successful antique dealer in Edinburgh - so it was the Auld Alliance the other way around and a good deal of fun. We had them home for dinner once and the next time he was in France, he wanted to return the favor, but had no place where or no intention to cook! He had taken the Rolls-Royce all the way from Edinburgh to the French Riviera and was on his way back when they invited us to the now defunct Bistrot de Guy Savoy across the road from the main restaurant. It was obviously as sensational as the previous time, and when he picked up the tab and paid for all of us, he said: "this is a lot cheaper that taking the Rolls around, so it is a very good deal!" "Bar aux Ecailles Grillées aux Epices Douces" - "Cod in its grilled scales and sweet spices"
Although I have not tasted this particular dish, I am sure you would find the description well short of the range of sensations you would experience looking at it, smelling it, wondering where to get the first morsel from and then delicately tasting the first bite...and then let it sink into your aroused tastebuds. 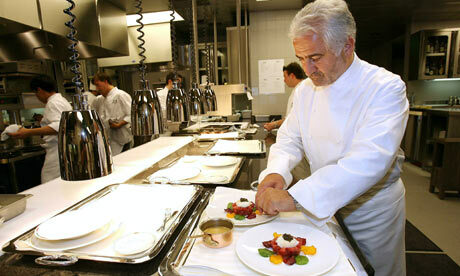 "Guy Savoy loves surprises. 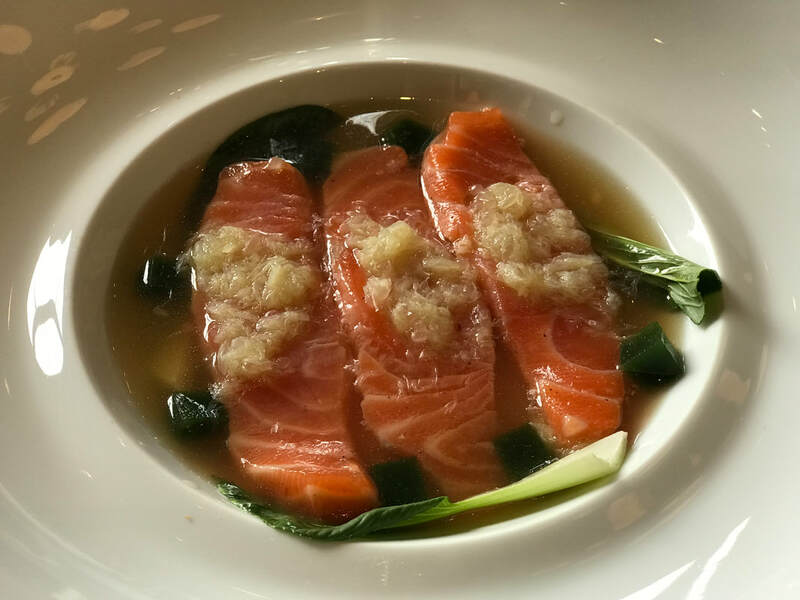 Whether it's being served an asparagus soup, then having the top lifted off the other half of the dish to reveal an asparagus mousse, or being served fish on a perforated plate that revealed a delectable broth underneath it in the bowl, I loved the combinations of textures and flavors." ​So, don't pay the mortgage and go...once in your lifetime!